USA: Ancestry.com Operations, Inc., 2013. 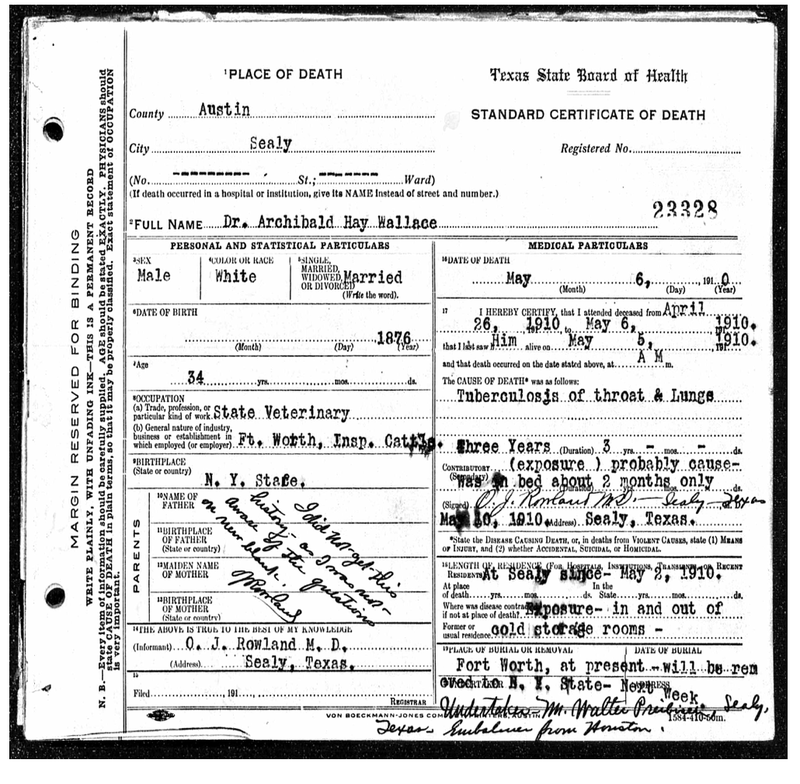 This report covers official information pertaining to Dr. Archibald Hay Wallace life and information as it appears on his standard certificate of death. Archibald Hay Wallace death certificate indicated that he was born in 1876 in New York City. He died on Sealy, Austin, Texas, USA on May 6, 1910 at age 34. The cause of death was recorded as being Tuberculosis (TB) of the lungs and throat (Death Certificate). The cemetery that he was buried in is called Mount Olivet, Burial place is Fort Worth, Tarrant County, Texas, United States of America (Find A grave.com). 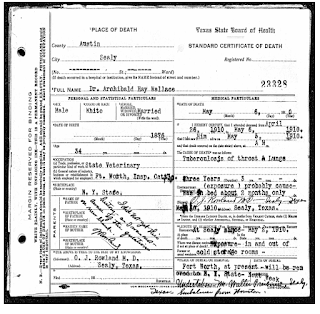 According to the United States Federal Census, of Archibald Hay Wallace states the following information: Resided at 1910 Fort Worth Ward 6, Tarrant, Texas, Status: Married Spouse's Name: Mamie E Wallace, Father's Birthplace: England, Mother's name: Helen Wallace Mother's Birthplace :Scotland Native Tongue: English, Occupation: Inspector Industry: Veterinary Employer, Employee or Other: Wage Earner Home Owned or Rented: Own Home Free or Mortgaged: Free Farm or House: House Able to Read: Yes Able to Write: Yes Years Married:5 Out of Work: Number of weeks out of work 0: Household Members includes: Archibald Wallace 33, Mamie Wallace 26 Wife, Stuart F. Wallace 2 Child, Helen Wallace 56 Mother (United States Federal Census). Archibald Wallace was Baptist on May 5, 1876 months after birth in New York City, New York, USA. He was a Presbyterian. The Church was located on Thirteen St. Presbyterian (Presbyterian Church Records). : Archibald Wallace was listed in the 1895 school year book which was title as Bric-a-brac. The school was listed as Princeton University located in Princeton, New Jersey, USA (School Yearbook). Dr. Archibald Hay Wallace Hay was listed as a graduate of Veterinary from the Department of the University of Pennsylvania on Wednesday June 9, 1897 at 11:00 a.m. The Veterinary Medical Association students met later that evening at 4:00 p.m.in the College hall for a more private ceremony. He was listed as Archibald Hay Wallace, V.M.D. (College Student List). Being a graduate of the Veterinary Medicine in the 1800 was rare for a young man. However, the demand for Veterinarians increase as it becomes more and more firmly established that both the private and public economy, as well as humanity, demand the preservation and improvement of the domestic animals (Veterinary Archives, 1897). Although Dr. Archibald Wallace received his Medical degree in Veterinary Science it did not stop him from joining the military. On July 1, 1903 he was station in Kansas City, Kansas, USA. Later he was station in Fort Worth, Texas, USA in 1907. The official register stated that he was a Civil, Military, and Naval Service of the United States and List of Vessels (Ancestry.Com. U.S. Register of Civil, Military and Naval Service). During 1903 in Kansas City, Kansas there was a great flood that caused the communities to face problems. There were dead animals and standing water that caused the threat of disease (The flood of 1903), It is stated that the Kansans sometimes define a year by its weather. The "blizzard of 1886," "flood of 1951," and the Dust Bowl's "Black Sunday of 1935." Such a year was 1903 (The flood of 1903). By Dr. Archibald Wallace being station in Kansas City, Kansas it could have been a factor that contributed to him getting tuberculosis and died in 1910 which was only seven years later. Although, Dr. Wallace died from tuberculosis of the throat and lungs it is essential that the history of tuberculosis be addressed in this report in order to prove that Dr. Archibald Hay Wallace was expose to a deadly disease that he suffered and died from. Tuberculosis is a potentially serious infectious disease that mainly affects the lungs. Wallace died in 1910 of tuberculosis (TB) it is stated that in 1993, the World Health Organization (NCBI-NIH)) declared TB a “global health emergency”. While improvements in global control have been implemented, TB continues to be a leading cause of death from an infectious disease in many countries of the world (World Health Organization NCBI-NIH). There may be a possibility that Dr. Archibald Wallace could have contracted tuberculosis from the animals that he cared for while in his practice as a veterinary. It is unfortunate that Dr. Wallace died from such a deadly disease in the nineteen century. During the time of his death in 1910 it was not known to the medical professional that tuberculosis could be spread by infected animals but based on his death certificate it states that he was exposed to the cold as he work in and out of the cold storage room (Death Certificate). According to Atlas of Transboundary Bovine TB is a disease caused by a specific type (species) of bacteria called M. bovis. Bovine TB usually affects animals such as cattle, but it can affect practically all mammals causing a general state of illness, coughing and eventual death. It can be transmitted from animals to humans as well as to other animals. M. bovis is a different type of bacteria to the bacteria M. tuberculosis, which is the type that usually causes disease in humans (Atlas of Transboundary). In conclusion, Dr. Archibald Hay Wallace died at a relatively young age due a disease that was widely prevalent. However, he accomplished major goals and aspirations in life such as getting married, having a child, and joining the Navy which he soon became an officer in the Navy. Dr. Wallace also graduated from veterinary school which could be have been one of the factors that contributed to his death of tuberculosis of the lungs and throat. Thanks to Dr. Archibald Hay Wallace for the sacrifices he made in the lives of the American people and for the caring and treatment of the sick animals. Provo, UT, USA: Ancestry.com Operations, Inc., 2014. USA: Ancestry.com Operations, Inc., 2012. UT, USA: Ancestry.com Operations, Inc., 2016. Department, University of Pennsylvania, July 1897. The Flood of 1903, Kansas Historical Society, July 2011, Date Modified: May 2016.